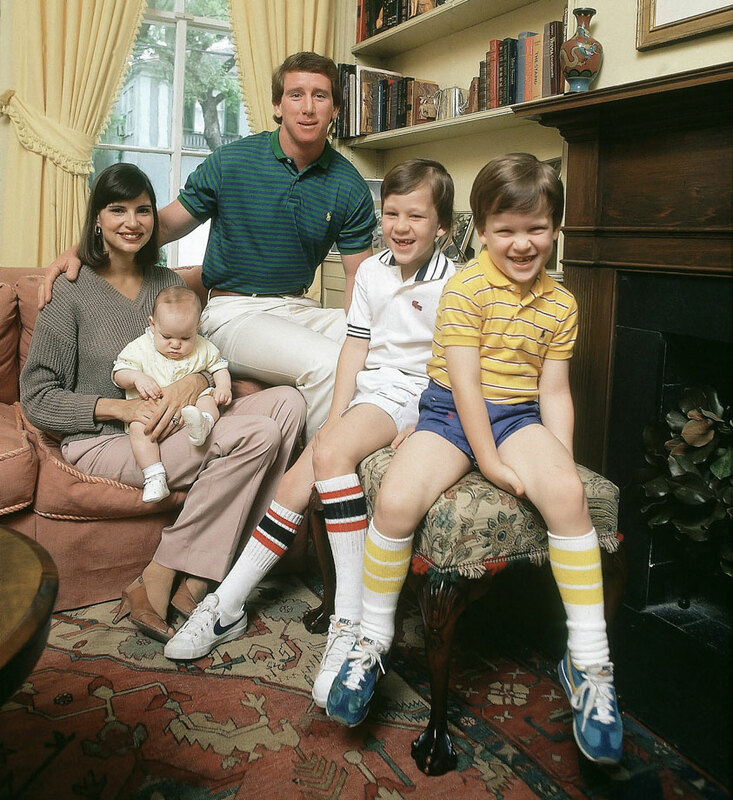 Peyton Manning (right), Cooper and baby Eli sit for a family portrait with mom Olivia and dad Archie. 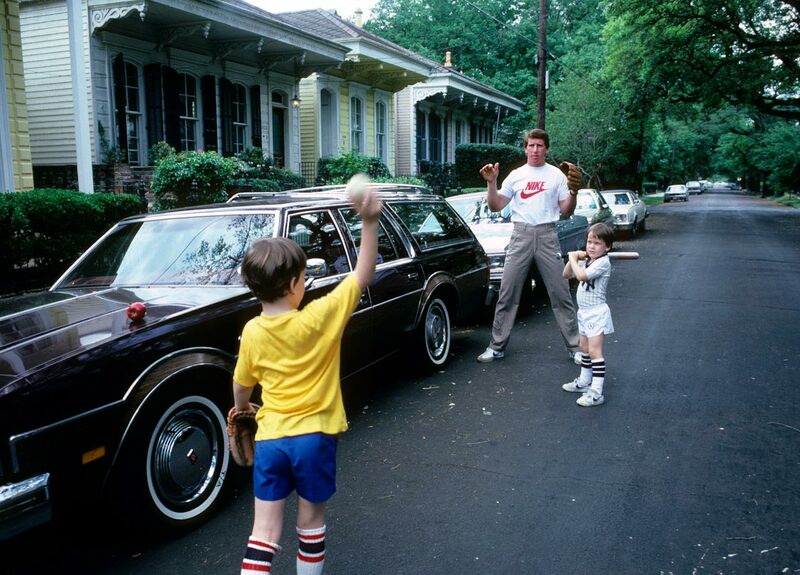 Peyton Manning takes some cuts against his brother, Cooper, as father Archie plays catch. 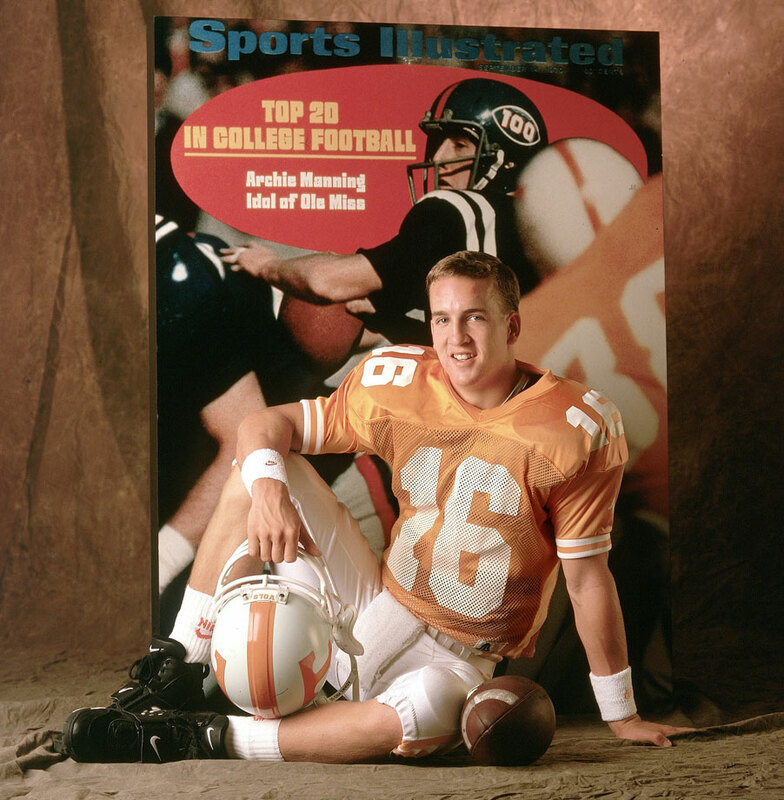 Peyton Manning strikes a relaxed pose during a 1996 photo shoot. A printout of his dad Archie's 1970 SI cover is in the background. Peyton Manning sits on a porch swing with his mom Olivia at their home in New Orleans. Peyton Manning and mom Olivia sort through stuff in his bedroom at their home in New Orleans. 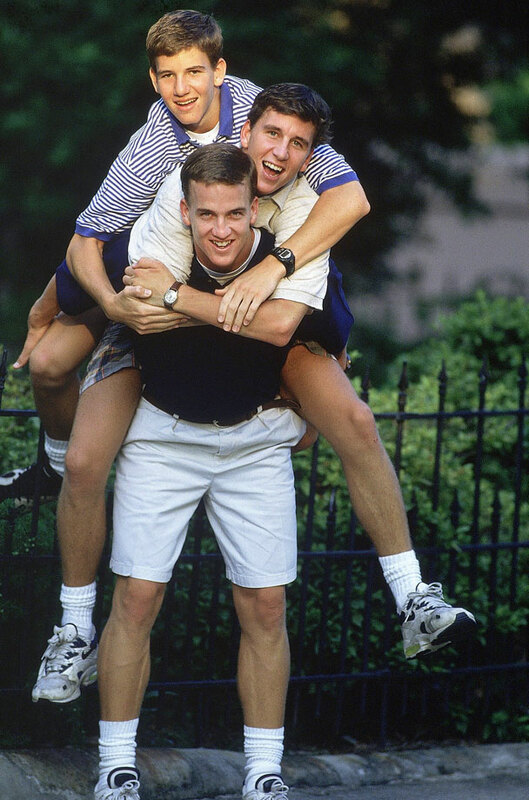 Peyton Manning carries his brothers Cooper and Eli on his back. 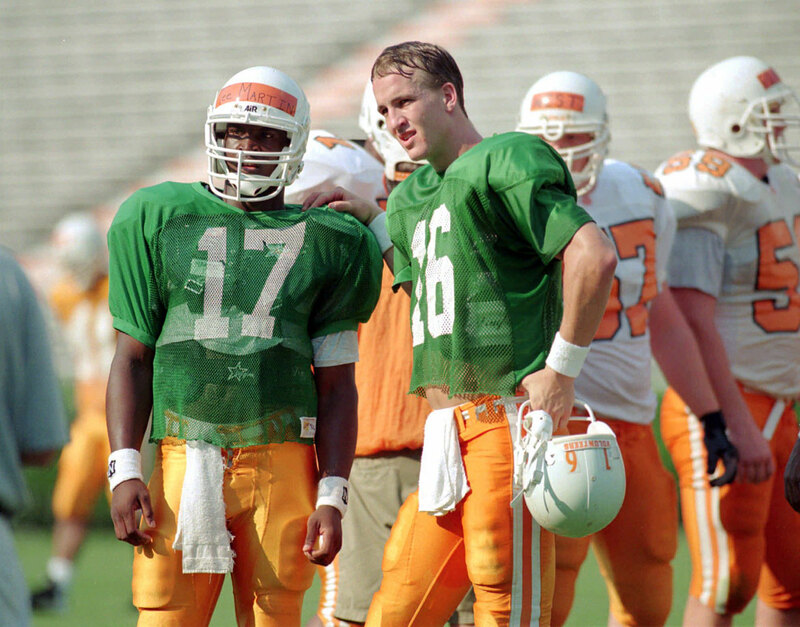 Peyton Manning gives some tips to backup quarterback Tee Martin during his Tennessee days. 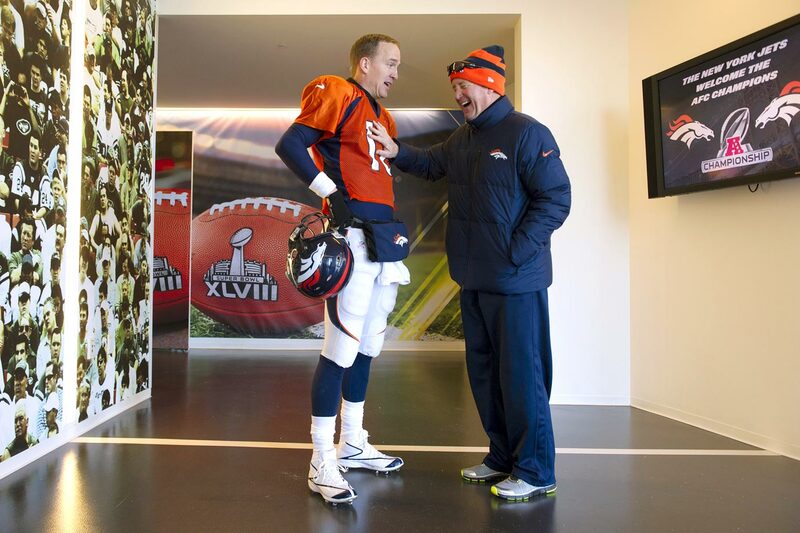 Peyton Manning talks with father Archie, himself a longtime NFL quarterback, immediately before announcing his decision to stay for his senior year at Tennessee. Manning was projected to be the No. 1 overall pick in the 1997 NFL Draft. 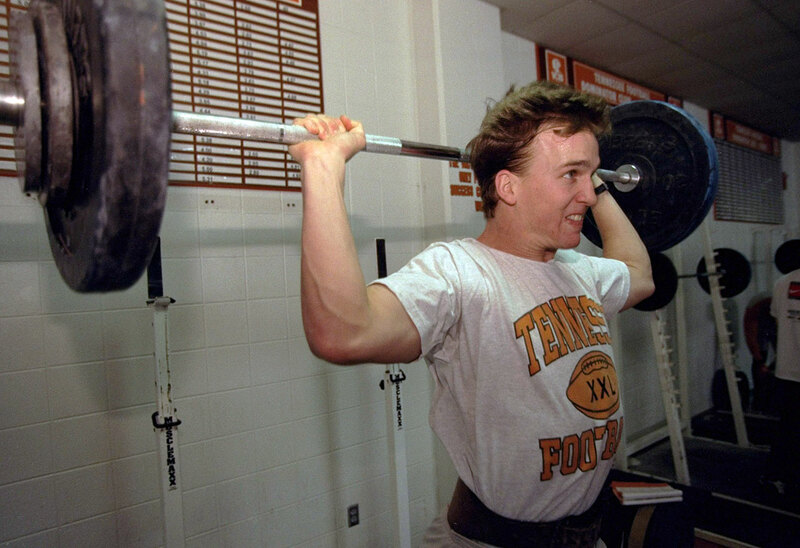 Peyton Manning lifts weights during his workout after announcing his decision to stay his senior year at Tennessee. 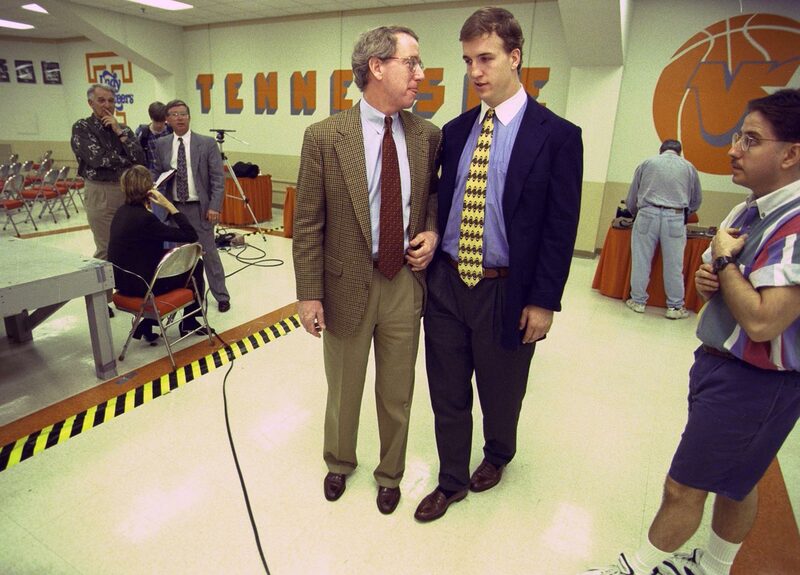 Peyton Manning his neck stretched by a trainer at Tennessee. Peyton Manning poses underneath a billboard thanking him for returning to Tennessee for his senior year and forgoing the NFL Draft. 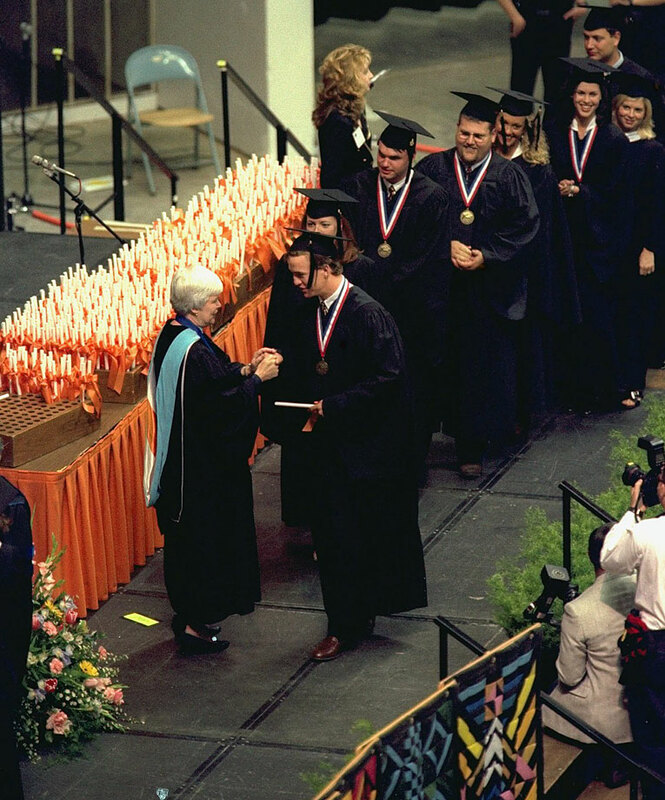 Peyton Manning receives his diploma at Tennessee's commencement ceremony. Manning was elected to the Phi Beta Kappa academic honor society while at Tennessee. 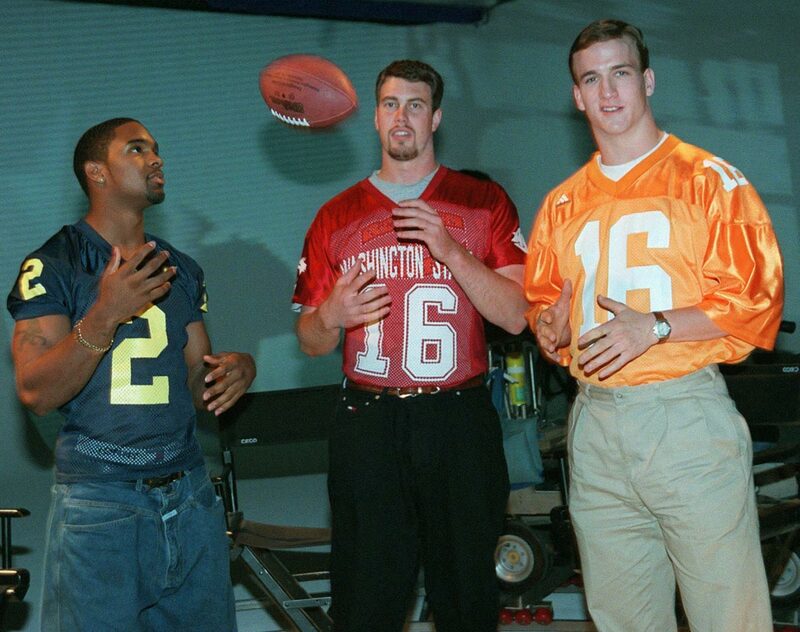 (Left to right) Charles Woodson, Ryan Leaf and Peyton Manning toss a ball around prior to the 1998 NFL draft. Manning, who controversially lost out on the 1997 Heisman Trophy to Woodson, was the first selection of the draft, with Leaf going second to the Chargers. Peyton Manning studies a Colts playbook at his apartment in Indianapolis. 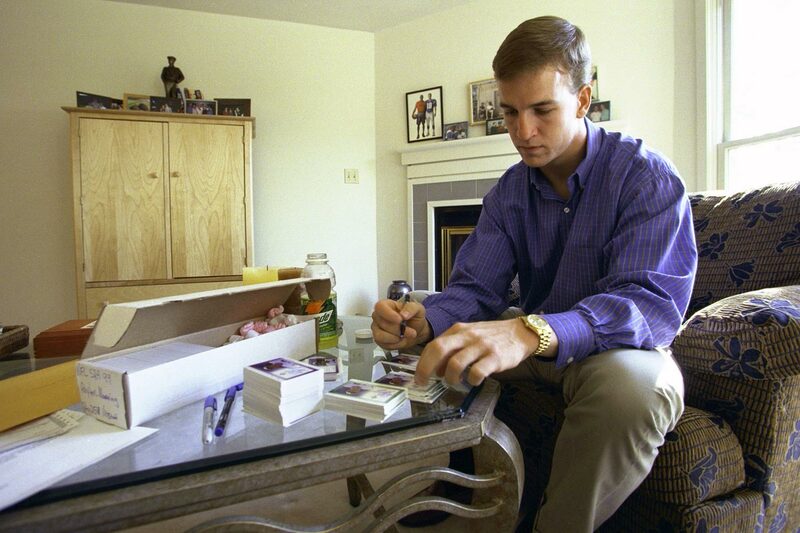 Peyton Manning autographs trading cards at his apartment in Indianapolis. Peyton Manning helps Edgerrin James' mother Julie fit the Colts running back for a suit. 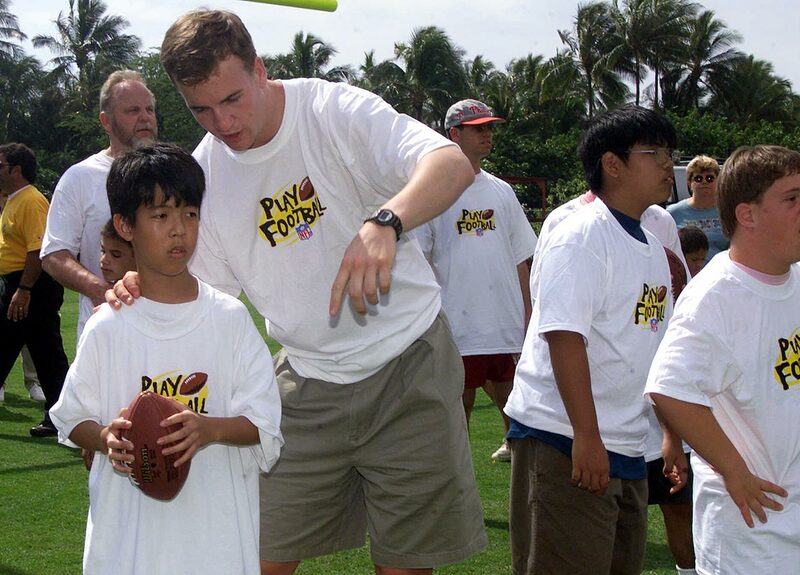 Peyton Manning gives passing instructions during a Pro Bowl Special Olympics Event. Manning has been named to 13 Pro Bowls during his career. 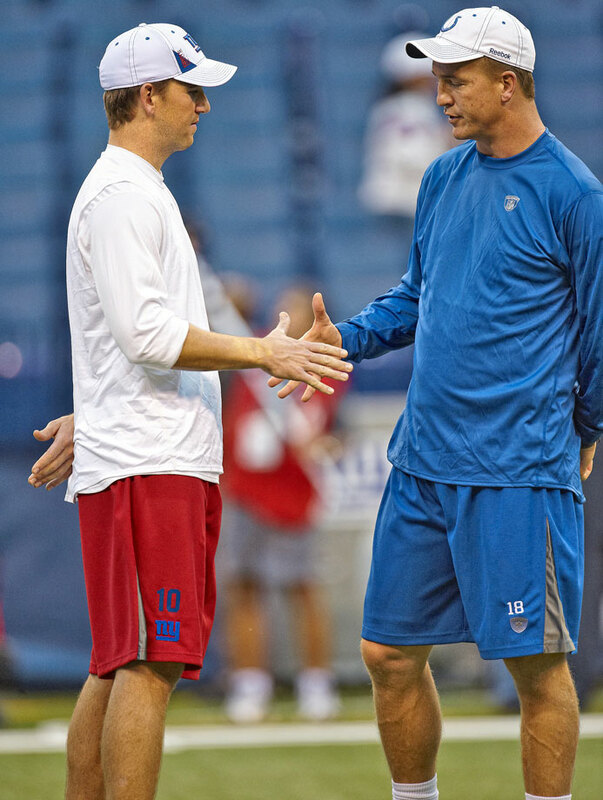 Peyton Manning pays little brother Eli a visit at Ole' Miss. 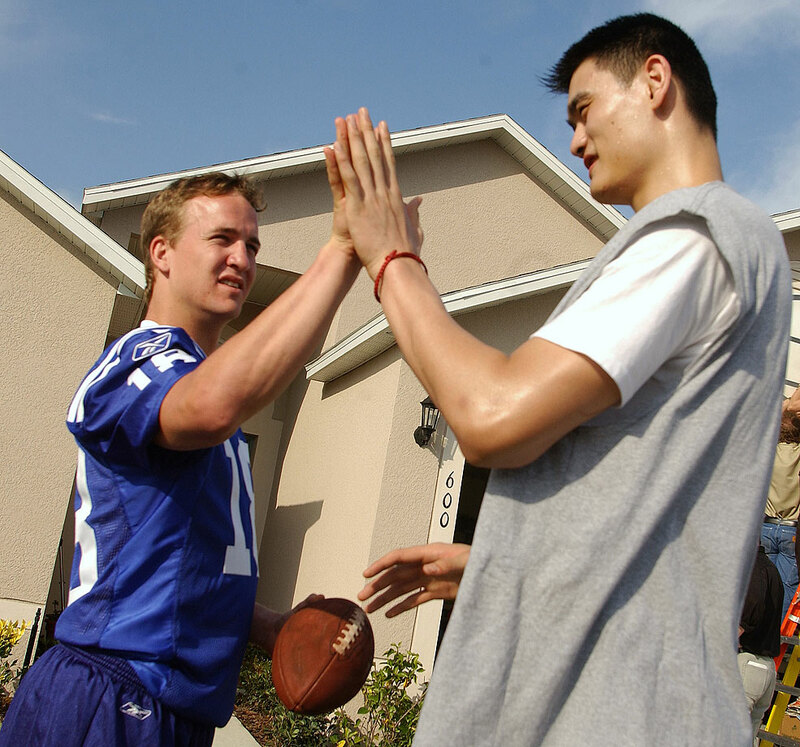 Peyton Manning and Yao Ming compare hand sizes during a Gatorade commercial shoot. 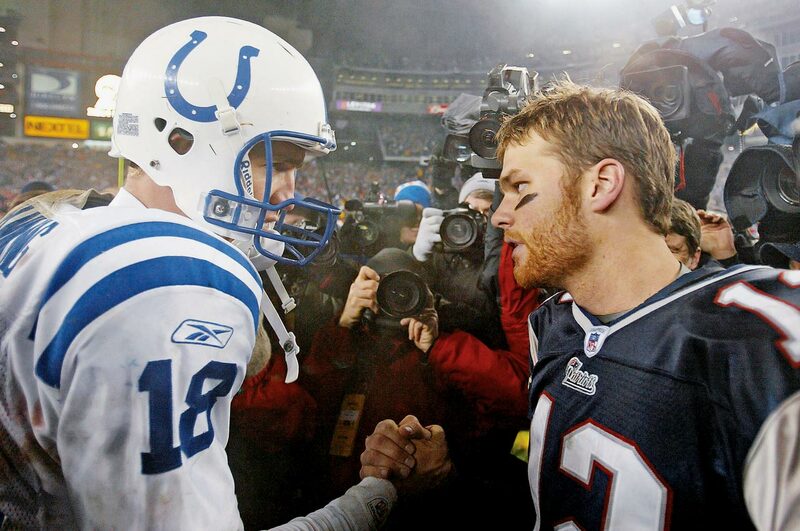 Peyton Manning and Tom Brady shake hands after New England's 24-14 victory over the Colts in the AFC Championship. 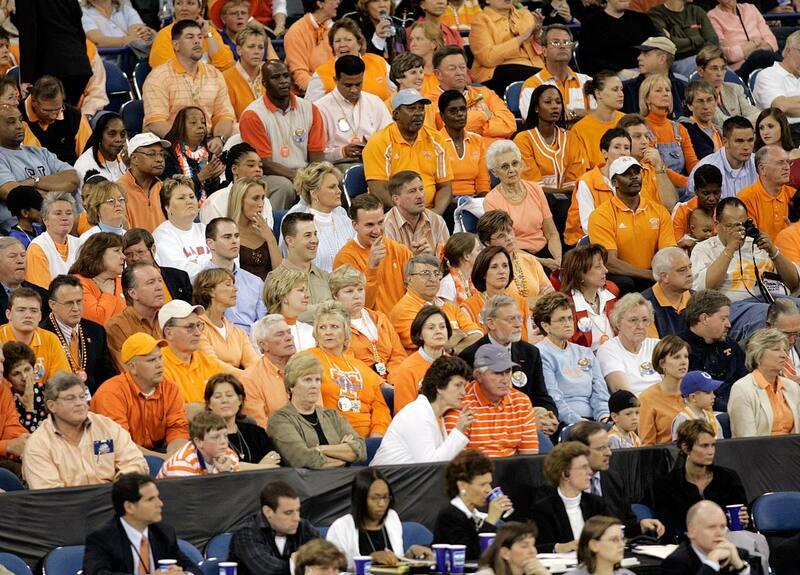 Peyton Manning takes in a Tennessee Lady Vols basketball game. Manning was 39-6 in his four years at Tennessee. 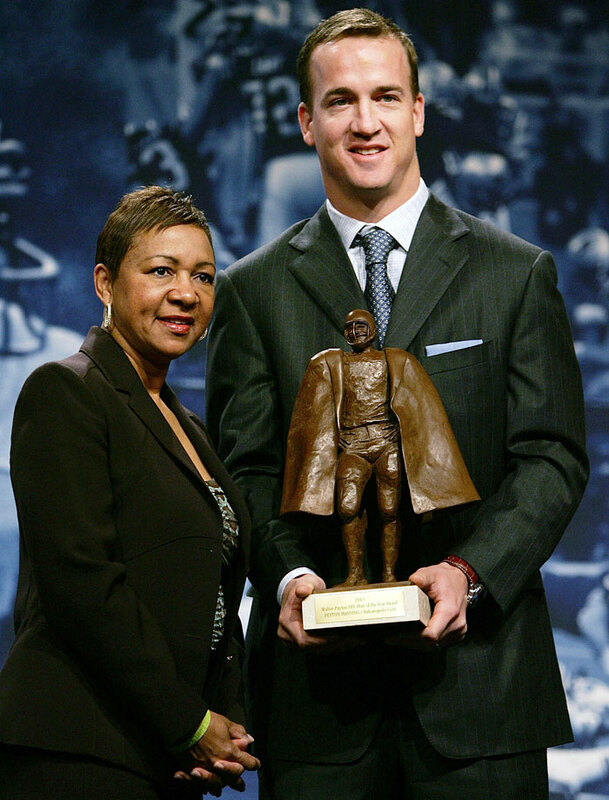 Peyton Manning holds the NFL's Walter Payton Man of the Year trophy alongside Connie Payton at a press conference. 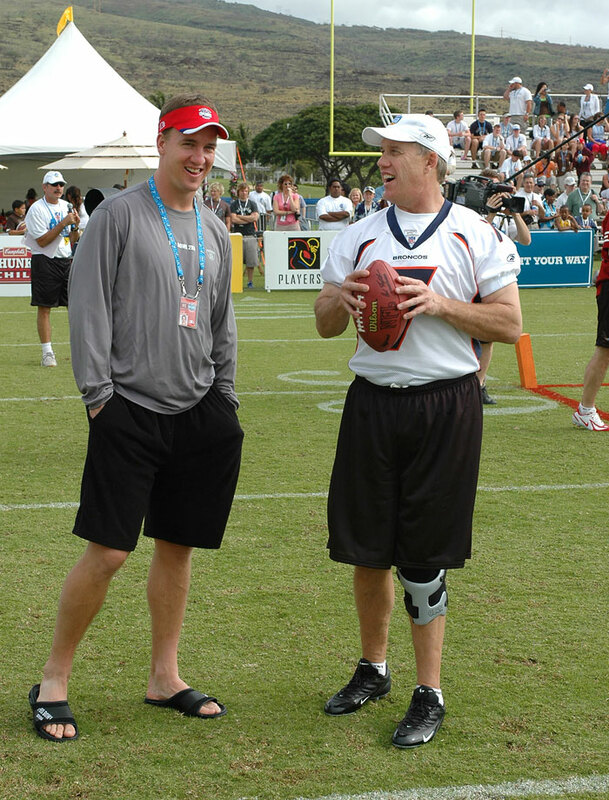 Peyton Manning spends some time with Broncos legend John Elway before the 2006 Pro Bowl skills challenge. The Peyton Manning-Marvin Harrison connection was the most prolific in NFL history, with the pair holding a number of QB/WR records, including the most career completions/receptions, passing/receiving yards and passing/receiving touchdowns. 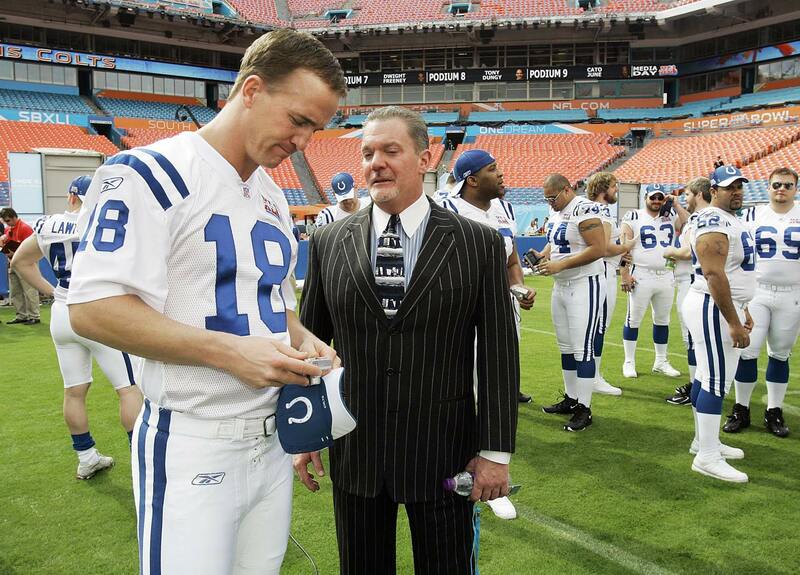 Peyton Manning chats with Colts owner Jim Irsay during Media Day prior to Super Bowl XLI. Manning was the MVP of the game, leading the Colts to a decisive victory over the Bears. Manning turned the downtrodden Colts into a perennial Super Bowl contender during his days in Indy, leading the team to eight division championships and three AFC championship games. 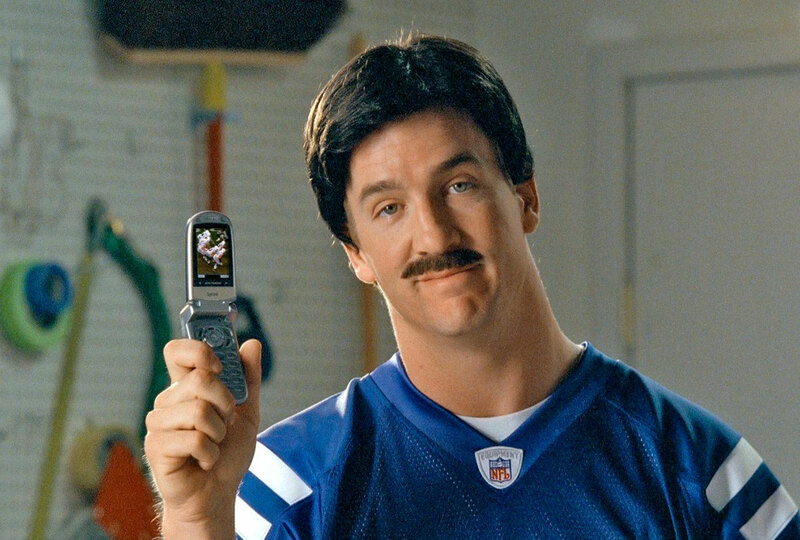 Peyton Manning sports a fake moustache in a Sprint commercial, one of many television spots he's been in over the years. While hosting Saturday Night Live, Peyton Manning plays an employee from the Bronx Zoo appearing on the talk show "Bronx Beat," alongside Amy Poehler and Maya Rudolph. 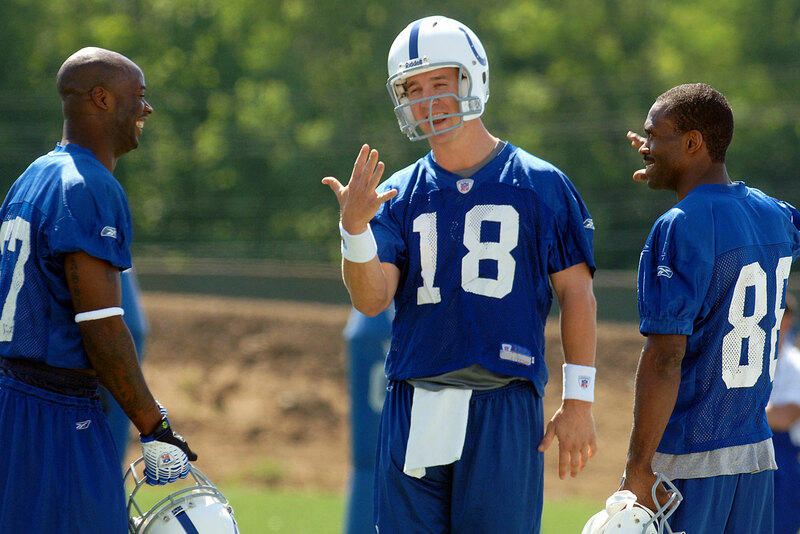 Peyton Manning laughs with wide receivers Reggie Wayne (left) and Marvin Harrison during Colts training camp. Harrison and Wayne were Manning's two favorite targets in Indianapolis. 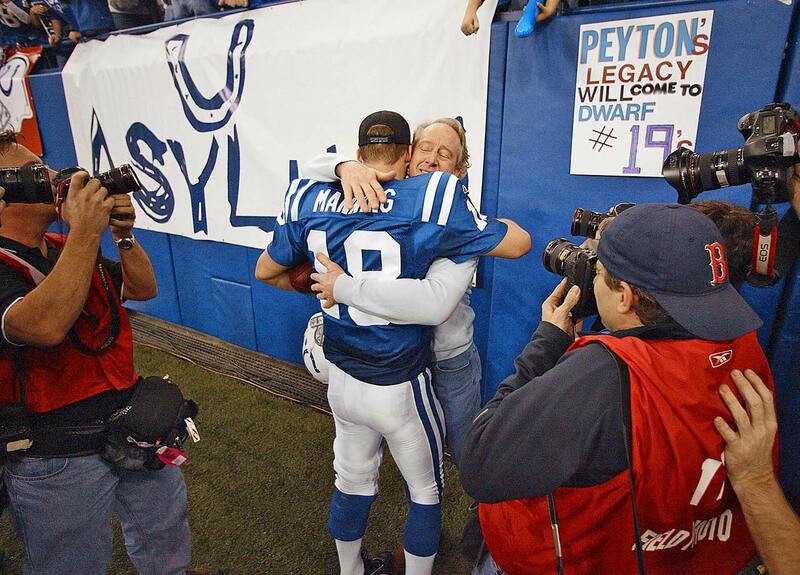 Peyton and Archie Manning hug in the moments after the Colts dramatic comeback victory over the rival New England Patriots in the 2007 AFC Championship Game. 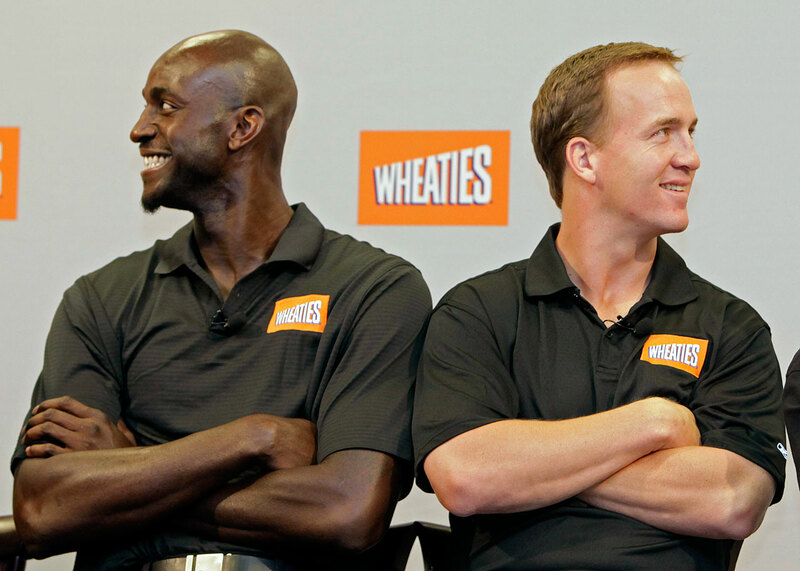 Two guys who eat their Wheaties every morning: Peyton Manning and basketball star Kevin Garnett check out a promotional video at an event in Indianapolis. 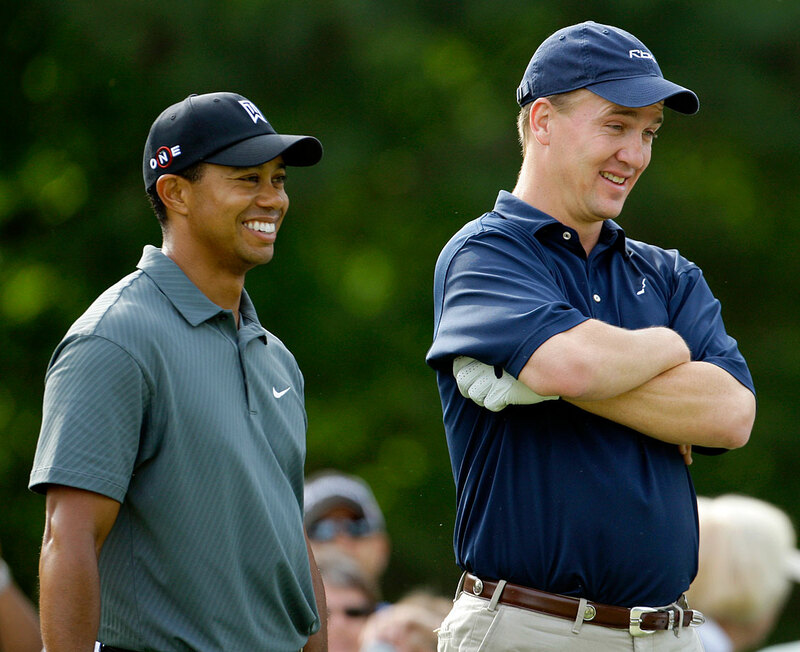 Peyton Manning shares a laugh with Tiger Woods during the pro-am of the Quail Hollow Championship golf tournament in Charlotte, N.C.
Eli and Peyton Manning film a commercial for Sunday Night Football on NBC. Though Peyton's stats are undeniably better, Eli has one more Super Bowl championship than his older brother. Peyton Manning stretches before a Colts-Packers preseason game in Green Bay. 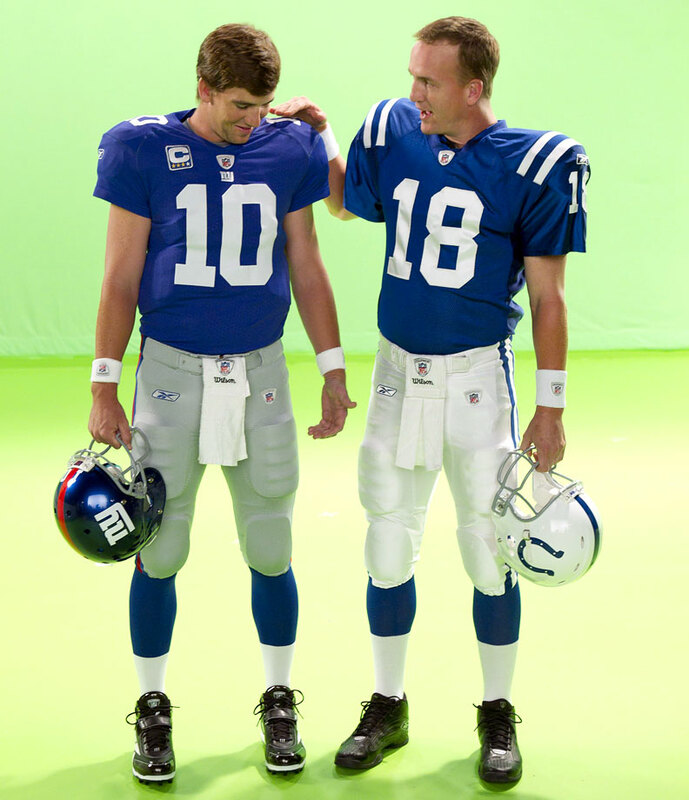 Eli and Peyton Manning shake hands before a Colts-Giants game in Indianapolis. 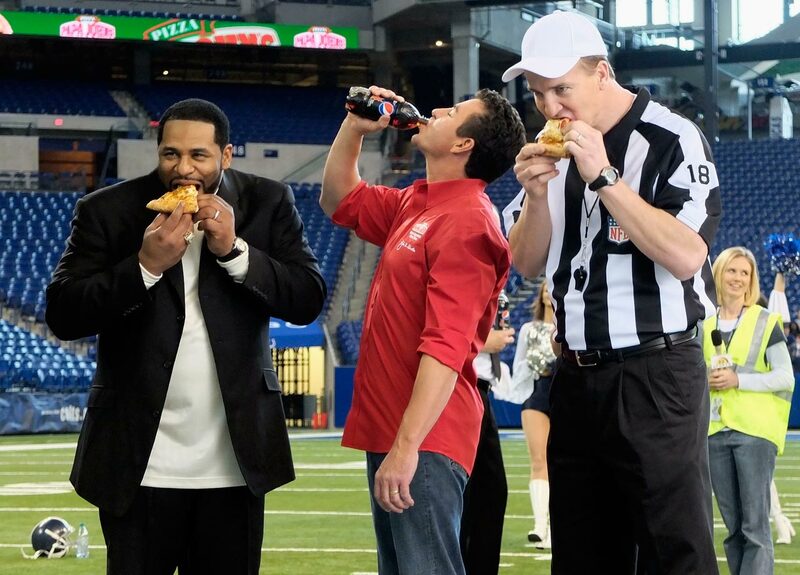 Jerome Bettis and Peyton Manning eat some Papa John's pizza alongside Founder, Chairman and CEO John Schnatter during a commercial shoot at Lucas Oil Stadium in Indianapolis. 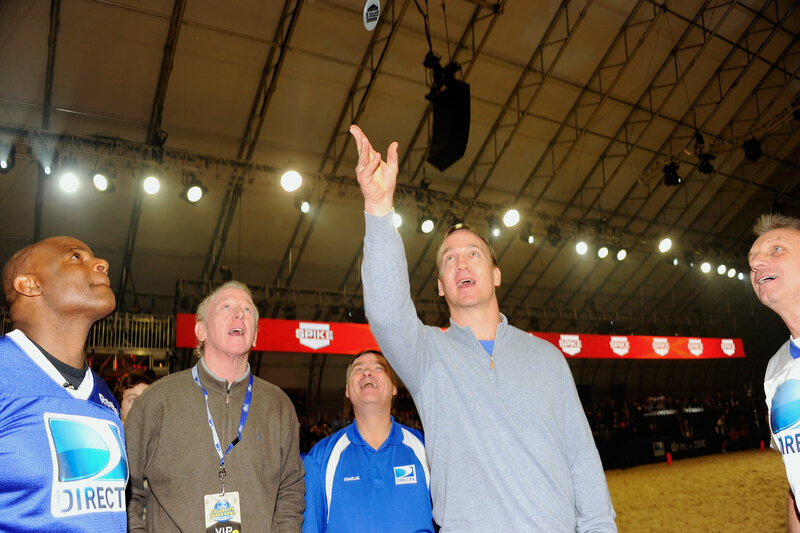 Peyton Manning handles the coin toss for DIRECTV's Sixth Annual Celebrity Beach Bowl Game at Victory Field in Indianapolis. (Left to right) Warren Moon, Archie Manning, DIRECTV CEO Michael White, and Joe Montana look on. 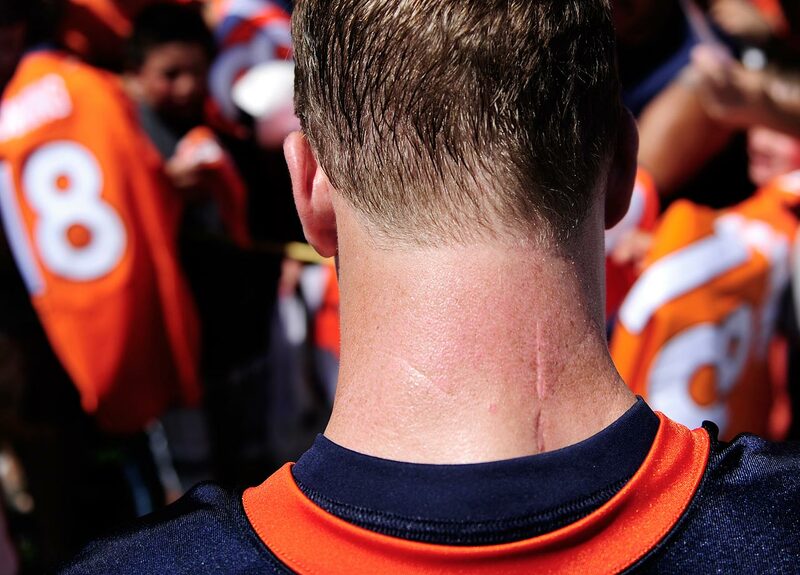 Peyton Manning's scar from neck surgery is visible as he signs autographs during the first day of Broncos training camp. 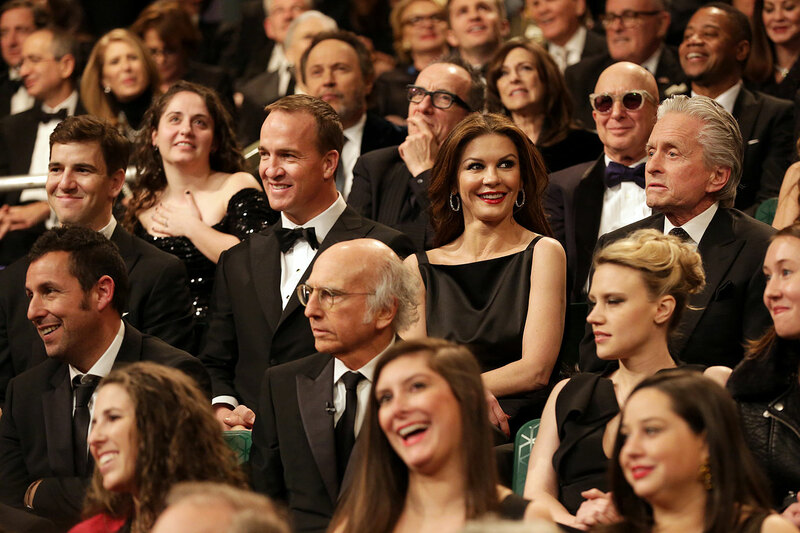 Peyton Manning gets a laugh out of Broncos head coach John Fox prior to Super Bowl XLVIII at MetLife Stadium in East Rutherford, N.J.
Eli and Peyton Manning smile alongside Catherine Zeta-Jones and Michael Douglas during the SNL 40th Anniversary Special's Audience Q&A in New York City. 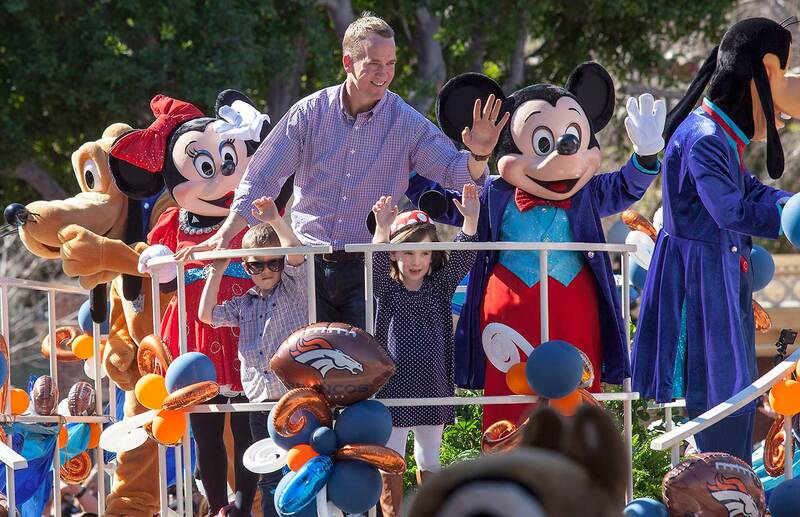 Peyton Manning with his children at Disneyland Park in Anaheim after winning Super Bowl 50 over the Carolina Panthers.